COBBLE HILL — Nerrisa Charles-Fanning delivered her baby daughter so quickly, she says, that if the hospital had not been so close, the child might have been born in the backseat of a car. Instead, Charles-Fanning made it from Red Hook to Long Island College Hospital in just 10 minutes. Lily Olivia Fanning was born in a delivery room soon after. Last month, the State University of New York voted to shut down LICH, citing longstanding financial troubles at the 155-year-old institution, after a Brooklyn judge found that SUNY had failed to properly publicize a prior Feb. 7 meeting, and ordered SUNY to hold a second public meeting. But the hospital's future remains uncertain as Judge Johnny Lee Baynes halted plans to shutter the hospital till a hearing May 2. Hospital workers and Brooklyn residents have loudly opposed the closure, and on Saturday, Charles-Fanning will join other toddler-toting neighborhood moms who gave birth at LICH, who will together push strollers down Amity Street in a march to save the hospital. The rally, kicking off at 10 a.m., will start at LICH Park at Henry and Amity streets, and finish at Court Street. "It was a great assurance to know my doctor and hospital were right there," said Cobble Hill resident Liz Holden, who encountered some difficulty during her pregnancy, but ultimately gave birth to a healthy daughter, Phoebe, in 2011. 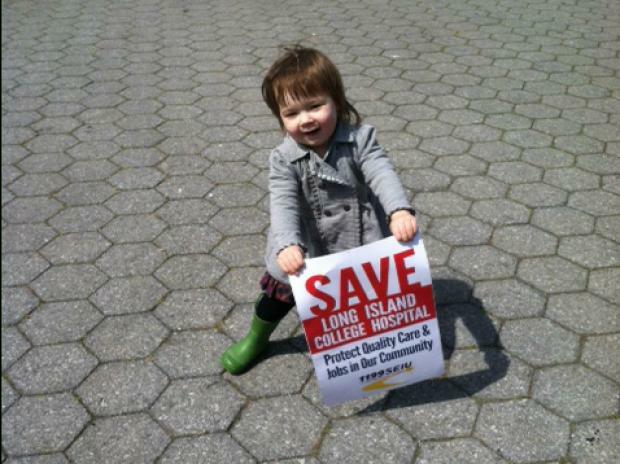 She added that she plans to march Saturday, the neighborhood's second rally for LICH in less than a week. SUNY's vote March 19 to shutter LICH did not mark the first time that the hospital has been threatened with closure. In 2008, LICH’s then-parent company, Continuum Health Partners, tried to eliminate the hospital’s obstetrics, pediatric and neonatal departments. That plan, however, was struck down by the State Department of Health, which found “insufficient capacity” at surrounding hospitals to make up for the loss of those services, according to a 2008 letter. Two years later, Long Island College Hospital merged with SUNY Downstate Medical Center, reportedly saving it from imminent closure under Continuum. Any decision by SUNY to shut down LICH must also ultimately be approved by the State Department of Health.